Great Confederate cavalry commanders in the Civil War’s Eastern Theater continue to evoke admiration amongst some and fascinating study. But for every Jeb Stuart or Wade Hampton there were numerous subordinate commanders who brought just as much to the table in terms of command ability and tenacity. One of those commanders, Brig. Gen. Rufus Barringer, now has a full-fledged biography devoted to his extraordinary life thanks to the efforts of one of his descendants, Sheridan R. Barringer. 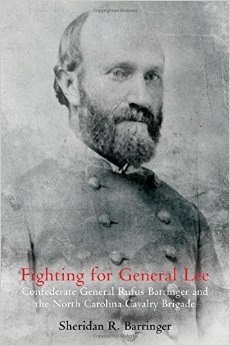 Fighting for General Lee: Confederate General Rufus Barringer and the North Carolina Cavalry Brigade (Savas Beatie, 2016) brings to the front the life of a man who is usually found in the background of military studies and monographs. Barringer’s war experience with the North Carolina cavalry brigade is narrated from his rise to command from the early days of war as a company commander all the way to leading the brigade into action with the war’s closing days. These actions included a grievous wound at Brandy Station in the war’s largest cavalry battle and leading a desperate rearguard at the Battle of Namozine Church on April 3, 1865. The book’s battle narratives are accompanied by maps excellently created by Hal Jesperson—a mainstay that now accompanies most Savas Beatie publications. Rufus Barringer’s life story involved more than just the four years of warfare, however, and Sheridan Barringer does a commendable job of contextualizing his ancestor within Rufus’ own time period. One of the more-striking elements of this life was Barringer’s support of Reconstruction politics, breaking ranks with such former rebels as Jubal Early. Further shattering the mold, “Rufus held progressive positions. . . including strong support for black suffrage” (246). Such political positions put Barringer in direct confrontation with men like his brother-in-law, D.H. Hill, who treated Barringer much like they did James Longstreet, another notable Confederate who joined ranks with Republicans after the war and were treated as pariahs because of it. Such political ostracizing was nothing new to Barringer’s life, as even before the war one such political spat almost led to his assassination—another story that Sheridan Berringer dramatically conveys. This work is a welcome addition to Civil War historiography, especially cavalry aficionados and those who wish to know what some Confederate officers did after their swords were beaten into plowshares. Sheridan R. Barringer, Fighting for General Lee: Confederate General Rufus Barringer and the North Carolina Cavalry Brigade. Footnotes, Bibliography, Index, 10 Maps. This entry was posted in Book Review, Books & Authors and tagged Benjamin Wade, Brandy Station, DH Hill, JEB Stuart, Jubal Early, Namozine Church, Reconstruction, Rufus Barringer, Savas Beatie, Sheridan R. Barringer. Bookmark the permalink. My collateral ancestor, Sgt. Major W. R. Webb, served in the 2nd NC Cavalry under Rufus Barringer and was one of the five(including Barringer) captured by Union spy Major Henry Young and his men dressed in Confederate uniforms on the night of 3 April, after the near destruction of the 2nd during the battle at Namozine Church on 3 April 1865. The five were hosted overnight by Gen Sheridan who offered them shelter and food before being marched to City Point where they “met” Lincoln, who had shared a desk with Barringer’s older brother, Daniel Moreau Barringer, when they were US Conressmen. Webb’s descriptions are included in this book.